W. B. "Bat" Masterson was born William Bartholomiew (nee, Barclay) in Iberville County, Quebec, Canada on November 26, 1853. Bat was the second of five children. "It was as a hunter he won his name of 'Bat', which descended to him, as it were, from Baptiste Brown, or 'Old Bat', whose fame as a mighty nimrod was flung all across, from the Missouri River to the Spanish Peaks, and filled with admiration that generation of plainsmen which immediately preceded Masterson upon the Western stage." 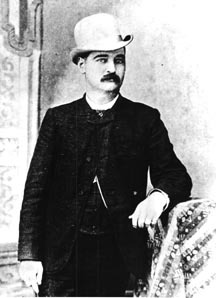 Bat Masterson moved to Kansas in 1871, when he and his family settled near the small farming community of Sedgwick (near Wichita, KS), along with a family friend, the buffalo hunter, H.H. Raymond. The Masterson family had previously farmed in New York and Illinois. That fall and winter, 18-year-old Bat headed west to hunt buffalo. With his 19-year-old brother Ed, he camped with hunters working along the Salt Fork River in present Comanche and Barber counties, Kansas. During visits to neighboring hunting camps, Ed and Bat Masterson met several future Western legends, including Billy Dixon, Tom Nixon, "Prairie Dog" Dave Morrow, and Bat’s lifelong friend, Wyatt S. Earp. He [Bat], with a partner, took a contract of grading a few miles of the Atchison, Topeka & Santa Fe Railroad, near Dodge. He was only eighteen years old at the time; this was in the spring of 1872. He says that he never worked so hard in his life, in filling this contract, which they did, with a nice little profit to their credit, of which he was very proud; but his partner ran off with everything, leaving him flat broke. He said it nearly broke his heart, grieving over his loss and over the perfidy of his partner, as he was only a boy, and the world looked dark and dreary. But this misfortune proved a benefit to him eventually, as he gained a lot of experience from the episode, and had many hearty laughs over it afterwards. That winter the Masterson brothers once again hunted buffalo. Their younger brother Jim Masterson joined them in their camp along Kiowa Creek southeast of Dodge. They shot and butchered up to 20 buffalo a day. According to a diary kept by H. H. Raymond, Bat was in and out of Dodge until at least October 1873. For the next several years, his travels are difficult to document. In June 1874, he was in the Texas Panhandle and was one of the buffalo hunters who took part in the Battle of Adobe Walls, Texas, starting June 27, Bat was one of twenty-eight men and one lone woman in the ill-protected settlement of Adobe Walls. They faced 800-1000 Native Americans, headed by Chief Quanah Parker, who led the Comanches; Lone Wolf, the Kiowas; Stone Calf and White Shield, the Cheyennes against the white hunters. By March 1875, Bat was back in Dodge City, where he was listed in the Kansas census as a "teamster." 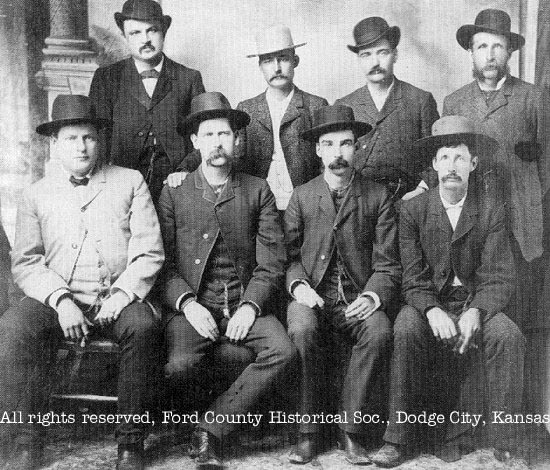 In early 1876 Bat Masterson and Wyatt Earp became law officers in Dodge City. Both were special policemen under Ford County Sheriff Charles Bassett; Earp was also an assistant city marshal. In June 1877 Masterson was arrested for interfering with the arrest of local character Bobby Gill (also known as Robert Gilmore), but the charges and fine were dropped in July. The Dodge City Times reported on October 06, 1877, that "W. B. Masterson, ser. as spec’l policeman" had been paid $25 for the month -- around $2000 in current value. He was also appointed under-sheriff during this period. Deciding to run for sheriff, Bat's made his announcement in the "Dodge City Times:"
"At the earnest request of many citizens of Ford county, I have consented to run for the office of sheriff, at the coming election in this county. While earnestly soliciting the sufferages of the people, I have no pledges to make, as pledges are usually considered, before election, to be mere clap-trap. I desire to say to the voting public that I am no politician and shall make no combinations that would be likely to, in anywise, hamper me in the discharge of the duties of the office, and, should I be elected, will put forth my best efforts to so discharge the duties of the office that those voting for me shall have no occasion to regret having done so. The home paper said that, "Mr. W. B. Masterson is on the track for sheriff. Bat is well known as a young man of nerve and coolness in cases of danger. He has served on the police force of this city, and also as undersheriff, and knows just how to gather in the sinners. He is well qualified to fill the office, and, if elected, will never shrink from danger." In November, 1877, Bat was elected sheriff of Ford County, KS — by three votes. The Dodge City Times noted on November 24, 1877: "Larry Deger only lacked three votes of being elected Sheriff of Ford county. His successful opponent, Bat Masterson, is said to be cool, decisive, and a bad man with a pistol." In 1878 his term of office was punctuated by a variety of violent acts: A train robbery in January, the murder of his brother Ed in April, Northern Cheyennes escaping their reservation in September, and the killing of Dora Hand, a popular Dodge City personality, in October. Bat’s next year in Dodge was also eventful. In January 1879 he chased a horse thief in Colorado; in February he was delegated to bring Cheyenne prisoners to town to stand trial for depredations committed during the fall raid; in March he joined in a conflict between the Atchison, Topeka & Santa Fe and Denver, Rio Grande & Western railroads for access to Colorado's Raton Pass. At election time that November, Masterson was defeated for his second term as sheriff. When his term was up, he left Kansas. After stints in Colorado, Nebraska, and Arizona, Bat was called back to Dodge in 1881 by his brother James, part-owner of a local saloon. Before he left town, he was involved in a gunfight with Al Updegraph, one of his brother's partners. For the next several years, he made a living as a gambler moving through several of the legendary towns of the Old West. He visited Wyatt Earp in Tombstone, Arizona, leaving shortly before the famous "Gunfight at the O.K. Corral." He spent a year as Marshal of Trinidad, Colorado. Original photograph of the 'Dodge City Peace Commission' in June 1883. Front, l-r; Chas. E. Bassett, Wyatt S. Earp, Frank McLain, and Neil Brown. Back, l-r; W. H. Harris, Luke Short, W. B. Bat Masterson, and W. F. Petillon. This is the version with Petillon beside Masterson. All rights reserved, FCHS. In 1883 he participated in a bloodless conflict and gunfighter gathering later called the "Dodge City Saloon War. " In November 1884, Masterson published a one-edition-only political newspaper in Dodge, The Vox Populi. On March 1, 1885, he was listed in the Kansas census as a 30-year-old Dodge City farmer. Over the next several years, he was in and out of Dodge. By 1891, he was living in Denver, Colorado, where he bought the Palace Variety Theater. He married an actress, Emma Walters, on November 21, 1891. He continued to travel in the boomtowns of the West, gambling and promoting prize fights. He began writing a weekly sports column for George's Weekly, a Denver newspaper, and opened the Olympic Athletic Club to promote the sport of boxing. He arrived in New York City in 1902 and was almost immediately arrested for conducting a crooked faro game and carrying a concealed weapon. The crooked gaming charges were dismissed and he was fined $10 for carrying the gun. For the next 20 years, he lived and worked within walking distance of Longacre Square, now Times Square. He became one of the "Broadway guys" that Damon Runyon wrote short stories about. The character of "Sky Masterson" in Runyon's Guys and Dolls is based on Bat Masterson. Starting in about 1904, Bat became sports writer for the New York Morning Telegraph. During this period, he was also a frequent visitor at Theodore Roosevelt's White House. In 1905, Roosevelt appointed Masterson U.S. Marshal for the Southern District of New York. This appointment lasted until Roosevelt left office in 1909. "In coming down the Arkansas Valley from Pueblo to Dodge...I could not help wondering at the marvelous change that had come over the country in the last twenty years. As I looked from the car window after reaching the Kansas line at Coolidge, I saw in all directions groves of trees, orchards and fields bearing abundant crops of corn, wheat and alfalfa.... The idea that the plains of Western Kansas could ever be made fertile was something I had never dreamed of." In 1921, Masterson died of a heart attack while working at his newspaper desk. He is buried at Woodlawn Cemetery in the Bronx, New York. In recent numbers of Human Life, there have appeared sketches of the careers of certain celebrated gunfighters who, by the prompt accuracy of their pistol practice, and the indomitable stubbornness with which they 'stood up against the iron', waxed famous in the West of thirty years ago. Meanwhile, there have descended upon the editor a tempest of written inquiry touching Mr. Masterson himself. It would be among things impossible to induce the author of those sketches, known intimately as 'Bat' Masterson, to attempt the story of himself. He will write biography, but not autobiography, being modest. Masterson, subject of this memoir, was early abroad upon the plains. What is farm land now was savage wilderness then, and those who invaded it did so with a knowledge that their hands must keep their heads. For twenty years, beginning when he was thirteen, Masterson lived by his own personal powers of offense and defense, and was in more or less daily peril of death from Indians or from outlaw spirits&emdash; common enough, these latter, in the West of that hour. Just as some folk are born poets, so others are born shots, and Masterson from the first evinced a genius for firearms. With either rifle or pistol he proved himself infallible, and of all who ever pulled trigger he has wasted least lead. It was as a hunter he won his name of 'Bat', which descended to him, as it were, from Baptiste Brown, or 'Old Bat', whose fame as a mighty nimrod was flung all across, from the Missouri River to the Spanish Peaks, and filled with admiration that generation of plainsmen which immediately preceded Masterson upon the Western stage. Once, so runs the tale, a gentleman of extensive pistol practice was testifying as a witness. "How many men have you killed? ", asked the cross-examining lawyer. The witness seemed for the moment posed, almost puzzled. At last, as one seeking exact light, he inquired: "You don't mean Mexicans and Indians?" Excluding Mexicans and Indians, Masterson's first gun trouble was at Mobeetie in the Texas Panhandle, the theatre thereof being a dance hall called the Lady Gay. Sergeant King, a soldier and a gambler, found fault with Masterson, and lay in prudent wait to take his life at a side door of the Lady Gay. The evening was dark. A girl named Anne Brennan came up. The lurking King, giving some excuse, asked her to rap at the door, conjecturing that Masterson, who was just inside, would open it. The King conjecture was justified; Masterson did open it, and asked the girl what was wanted. At the sound of his voice, King stepped forward and, placing the muzzle of his pistol against the Masterson groin, fired. Kind fired a second shot, and accidentally killed the girl. Coincident with that second shot, however, Masterson's pistol exploded, and King fell shot through the heart. The girl, King, and Masterson went down in a bleeding heap; the first two were buried while, to the amazement of the surgeons at Fort Elliot, Masterson was back in the saddle by the end of eight weeks. So much for the recuperative powers of one who had lived healthfully and close to the ground. Masterson's hat measures seven and three-eighths. Wise, cool, wary, he is the born captain of men. Generous to a final dollar, the poor and needy make for him like night birds for a lighthouse. To a courage that is proof, he adds a genius for justice, and carries honesty to the pitch of romanticism. To these virtues of mind and heart, add the thews of a grizzly bear, and you will have a picture of Masterson. Such he is; such he was when, at the age of twenty-two, the public elected him sheriff of Ford County, whereof the seat of justice was the stormy little city of Dodge. Masterson's brother Ed was made Marshal of Dodge, somewhat against the wish of Masterson. The latter feared that the 'bad men', who came and went in Dodge, would 'out manage' his brother, whose suspicions were to easily set at rest. It fell out as Masterson had feared. Mr. Wagner, drunk and warlike, sought to enter Mr. Peacock's dance hall, questing trouble. Marshal Ed Masterson, instead of pulling his own gun, as prudence would have dictated, and stopping the violent Wagner with the cold muzzle thereof, seized that truculent person by the shoulders. Instantly, Wagner's six-shooter was brought to the fore. With that Marshal Ed Masterson shifted his left hand to Wagner's wrist and, for the moment, put that drunkard's weapon out of commission. There the two stood, the situation deadlocked. From across the street, Bat Masterson saw events and started to his brother's aid. He was still sixty feet away when Mr. Walker, like Wagner a person of cows, ran from the dance hall and snapped his six-shooter in Marshal Ed Masterson's face. The cartridge failed to explode. Walker was never given the chance of trying a second, for Bat Masterson put three bullets from his Colt's .45 through him before he could hit the ground. As the dead Walker went down, Wagner, still in a grapple with Marshal Ed Masterson, got his gun to bear and shot Marshal Ed Masterson in the body. The latter fell wounded to the death, coat afire from the other's powder. Wagner fell across him, a bullet from Bat Masterson's pistol through his brain. After this fashion did Masterson maintain law and order in Dodge. Many were his battles, many the wounds he wrought; it was said that the local doctor traced half his practice to the untiring efforts of Masterson on behalf of communal peace.